During my vacations I did not sew much, nor did I surf the Net very much. I was off line for three weeks. Humm it did me lots of good! Enjoying fully the great outdoors feelt really good. The Burda tunic is done, but I did not take pictures of it yet. Well I should say, DH was not available to take pictures. Today, I was alone at home sewing. I did not want to work on UFO's, I wanted a new toy to play with ;-) sort to speak. 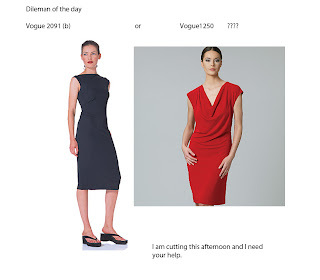 I launched a quick survey on Facebook to decide which pattern I would cut today between Vogue 2091 and Vogue 1250 (see picture below). 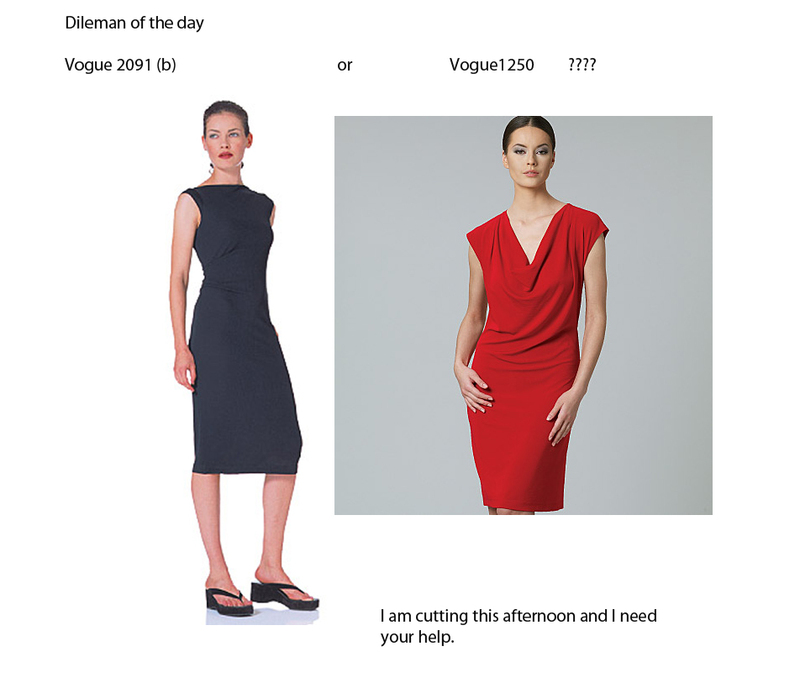 Since I felt that Vogue 2091 was more my style and all opinions were pointing in that direction, this is what I cut. Here are picture of the unfinished dress. I still need to set the sleeves and ot hem the dress. I grabbed DH for a quick photos session as he was getting ready to BBQ our dinner. I was pushing my luck, but I did not care. That's it for today, I have to go and finish it. D1 and I ADORE it!!!!!! What fabric did you use? Joanne, this is a very silky and fluid knit I bought at Emma one sock last year or this winter. It is so confortable. If you send Linda (at EOS) the picture, she might suggest you something similar. The pattern is OOP but still available on Vogue's site at 20$ or 17$ if you are a member. Thank you for your nice comments. Awesome and the dress fits like a glove. This pattern was given to me some time ago and I've never used it. must rethink that. Your fabric is very special. WOW! So wonderful! The setting is spectacular and the fabric used is wonderful ... finish it, please ... sure that it will have much wear, so elegant! What a wonderful combination of pattern and fabric. 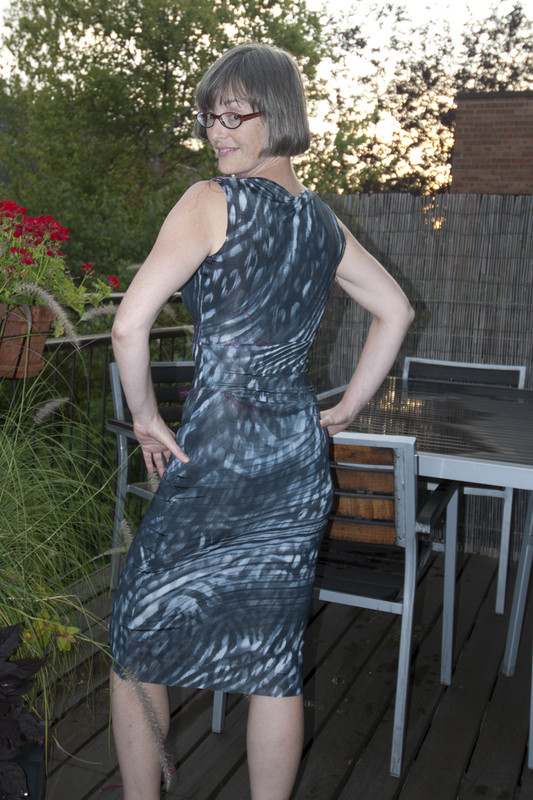 I made the dress long ago in a black knit, but it really looks striking in the print. This was a great choice. 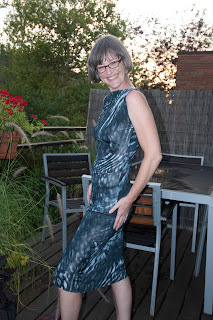 Vogue 1250 is definitely a great pattern that works for everyone. But trying a different is great too. Your dress fits perfectly and you look outstanding in it. Very classy dress! You look wonderful in it. Love this dress on you and the fabric is perfect. Wow, it looks wonderful on you. I have been thinking about this pattern lately, I think it is time I pulled it out! Wonderful. I'm just getting ready to sew mine together and have noticed the instructions have no mention of seam allowance. Nor does my pattern have the circles with a plus within that denotes bust, waist and hip circumference of the finished garment..